O.K I never seem to win these candies but you have to try right? Especially as I adore LOTV stamps anyway. Plus I need something to take my mind off my chicken pox - I really can't stand the sight of the rash now and it's going to be dayssss before they go, not to mention they are starting to itch :( and I am dreading them leaving scars, especially the ones on my face! So, anyway, this lovely candy is courtesy of LOTV, for their fabby new release due out on the 1st June and is being hosted via their challenge blog here but you only have until end of sat 29th to enter, so what are you waiting for?! 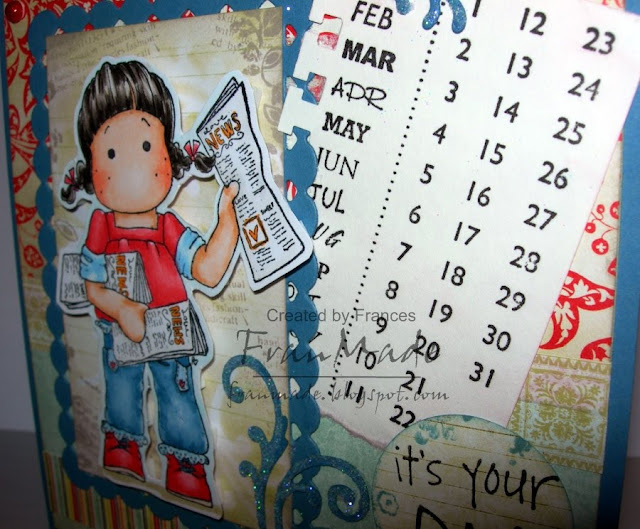 CCT theme this week is no designer papers (just when I went and got more yummy new MME & GCD papers too!) So I stamped my own background piece onto a piece of kraft card using a fab get well stamp kit from Elzybells which I knew would be great to use with all my 'get well' type stamps. 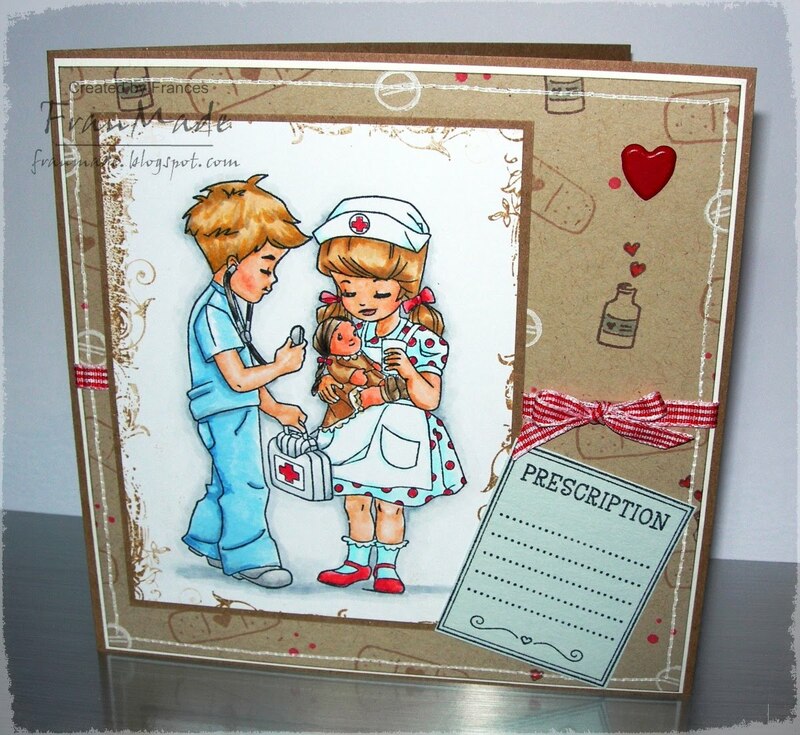 This cute Dr & nurse is Whiff of Joy which I have stamped together. The daisy flower is just basic quilling of 6 loose circles pinched at one end to create the teardrop shape and the centre is a quilled tight circle. The yellow and pink pom pom looking flowers are just strips I have fringed with scissors before quilling then fluffing out. Then the fourth flower if you can call it that is the teeny tiny lilac rose bud. You can find loads of instructions for quilling if you just google it. 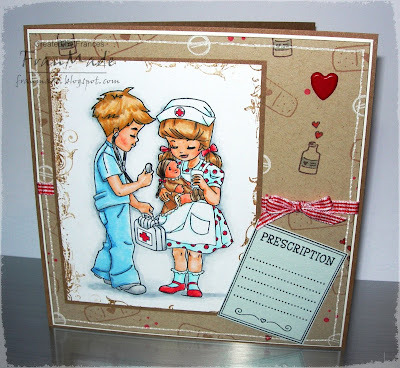 Quilling is an artform in itself and you can take it to a whole other level but for me, it's just a fun way to add little embellies to my stamped images. 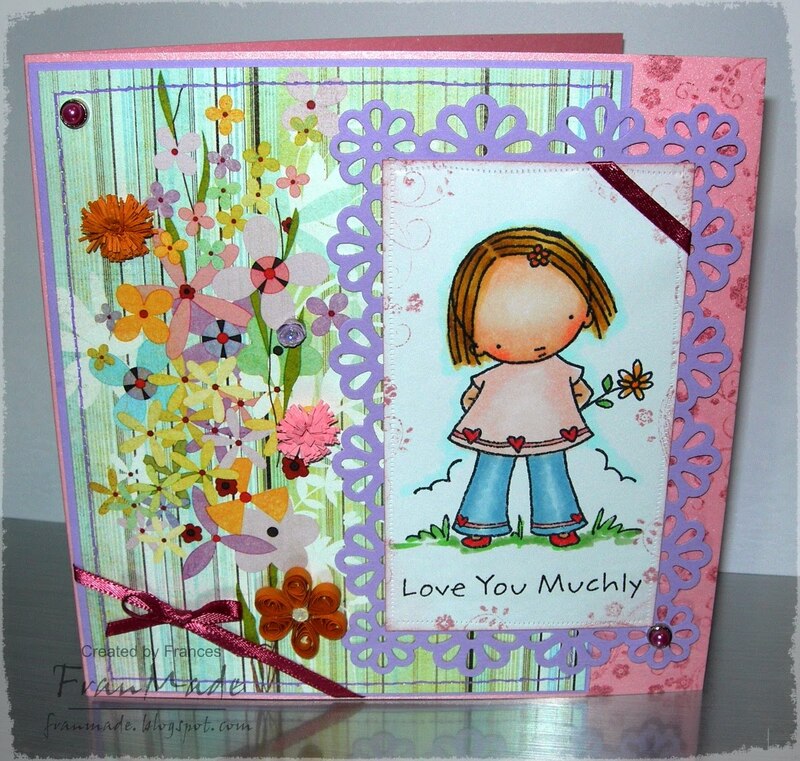 I think I'll be doing more of the fringed flowers as they will be great for the centres of my punched out paper flowers. 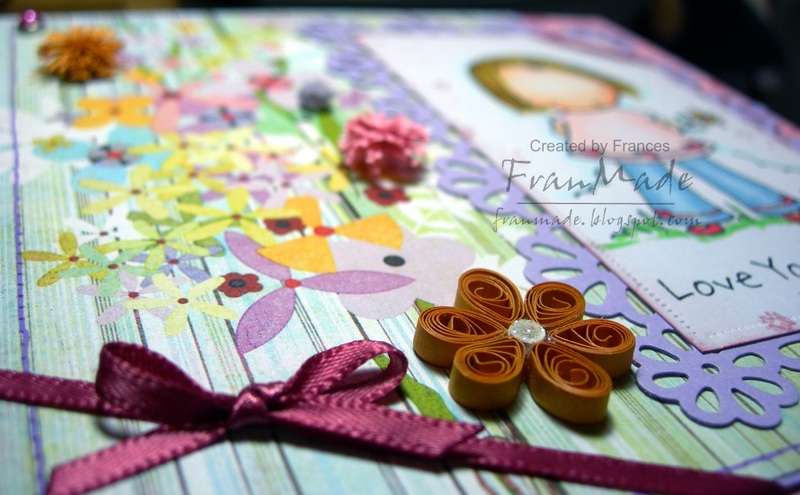 I also think quilling will be more prominent soon as Cuttlebug have some new quilling dies due out later this year (saw some videos and the flowers they make look fab) and I think will get more people interested. Well, that's all the cards I've got to show this week. Thanks for your continued visits and I hope to see you next week sometime. I'm also hoping to see some of this supposed heatwave we're supposed to be getting, it's just about sunny at the moment but heatwave it's not! Which probably isn't a bad thing for today, as got to contend with no water later tonight till 6am tomorrow (doing some waterworks in the area) so best go and fill some buckets & the kettle for later! 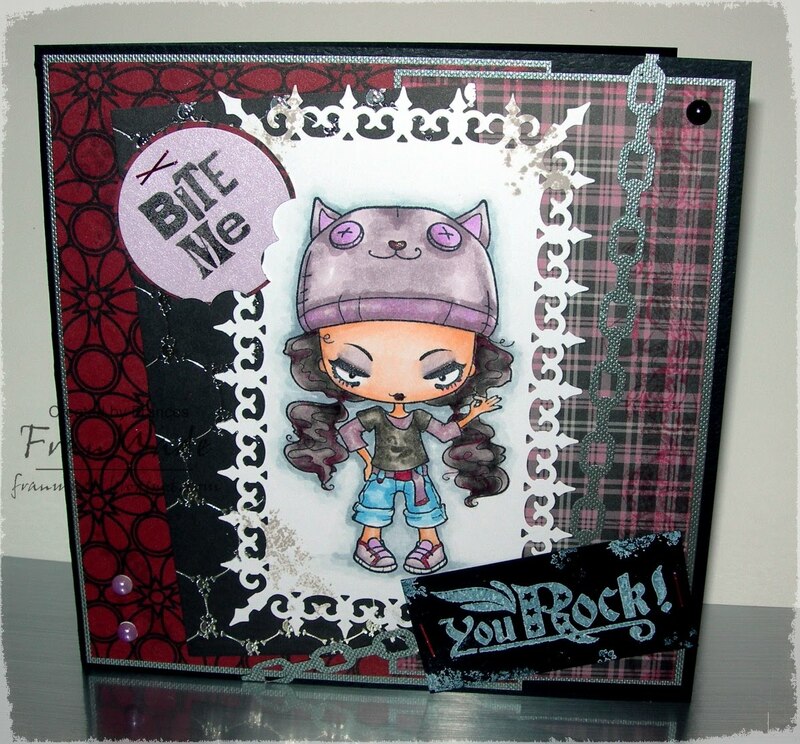 CCT Sketch by Caz: card with bite! It's sketch week over on CCT, a fab one by Caz (nice and simple, how I like them at the moment). 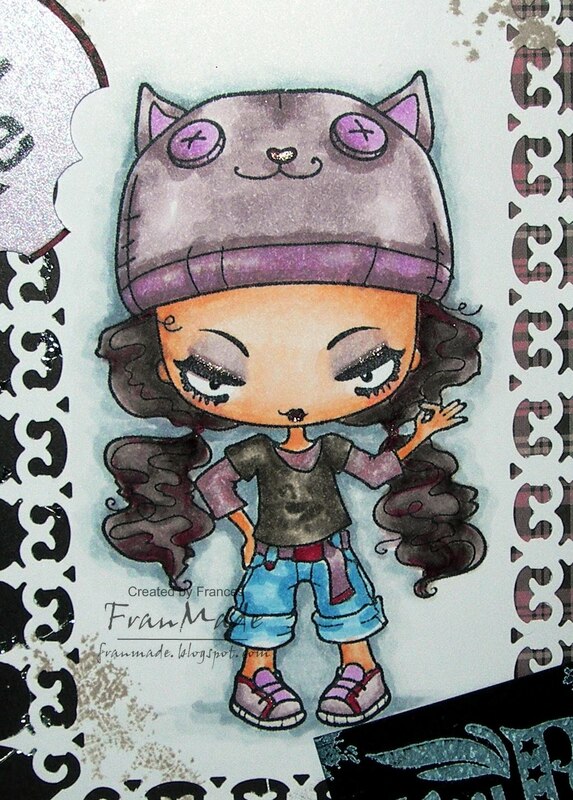 I think I may have got ontop of this whole being at work all the time now but still having time to make cards by taking my Copics/images into work and colouring when it's not busy ;) Although I do find this harder (I like to use the papers to help choose what colours to use!) but at least this way I should start having a pile of coloured images ready to use and with the amount of dp I have it shouldn't be too difficult to find colours to match! Although looking at this now, it probably isn't as good a match as it could have been but the papers where the first to come to mind to go with the whole grungy/goth girl look I was after. I really love this new line from the Greeting Farm as they are more edgy then the sweet Anyas (which I love, but not everyone loves sugary sweet) and I had a blast colouring her in and giving her eye make up and glittery eyeliner :) Not too happy with the hair - tried to give her red lowlights but not as good as I would have liked. Hello! I'm back with the card I made for my Sister last week but wanted to wait till it floated over to the US (Happy Birthday Sis - hope you've got this by now, if not, this is what you're getting LOL- hope you like it ;)). 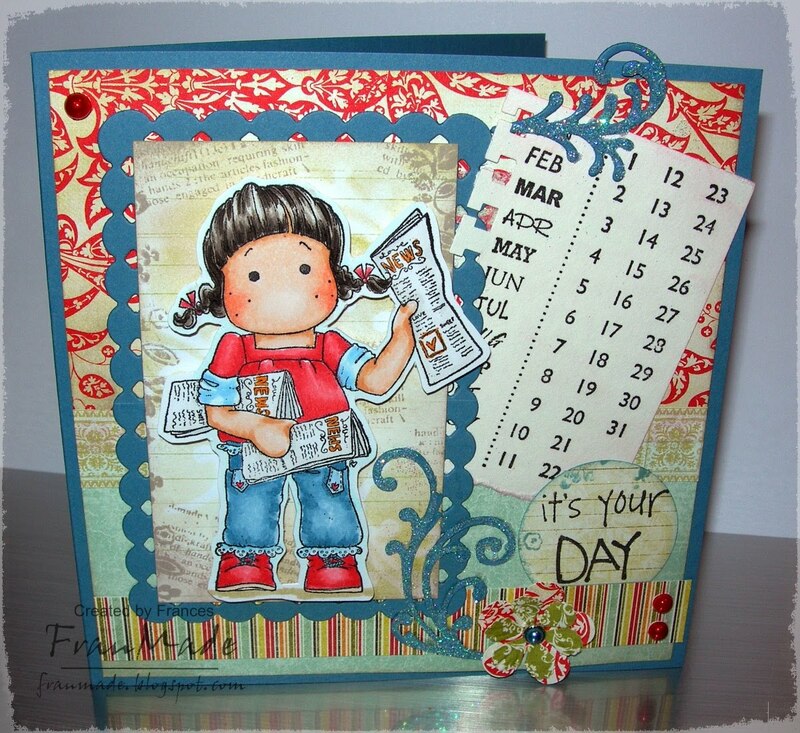 I've used a cute LOTV bunny stamp, coloured as always with my Copics and as this one is floating along I had to use my Heroarts cloud stamp again to make the background behind her (stamped with matching colours of distress inks) and then the layout of the card just sort of fell into place after that, after much of my usual fiddling around. I've cut out the image freehand to make a sort of cloud shape. The sun is last month's freebie stamp off Craft stamper mag which I've cut out and added a tiny sentiment in the middle. 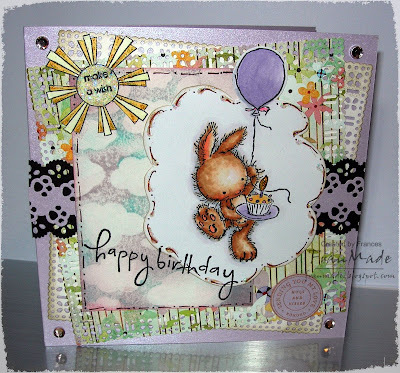 The happy birthday is Basic Grey stamp, the circle sentiment is from a SU set. Papers are from the gorgeous Baisc Grey 'Kioshi' pad which I have only just broken into (always have to look at them awhile before I can bear to cut/use them LOL) and teamed with some lilac pearlescent cardstock. Then lots of my MS and EK punches used (the EK success paw print one is fab - like the way I staggered them either side of the strip so it looks like set of footprints?!). Lots of doodling and then stickles glue (on the flame of candle, around cloud and in sun) & gemstones for bit of bling and finishing touch. I've pretty much just listed everything I've used so won't bother repeating it in a stash list. CCT theme this week is 'someone special'. 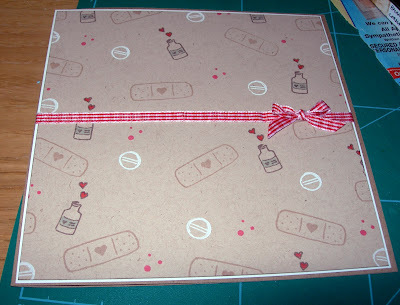 I've made a birthday card for 'someone special' (as it's bound to go to a family member and they're all special, right?!) - just not sure who yet ;) but when I do, I'll just ring their birthdate with a red pen to personalise it. Wasn't too sure where I was going with this when I started this one but am really pleased with how it turned out now. Thank you for dropping by and I'll probably be back early next week as I do have another card made but it's for my sister and I want to make sure she gets it first, before I show it on here, as I know she reads my blog ;) So until then, have a lovely rest of the week and enjoy your weekend. Hello there! Second post from me this week - woohoo :) Having got some more Magnolias from the fairytale range recently, it made me look at my huge collection and realise I probably should actually start using them again if I'm to keep buying them LOL. So I inked up this cutie to go with another paper flower I made (they are soooo fun to make) at the start of the week and have finally finished putting it all together after sitting on my desk all week. 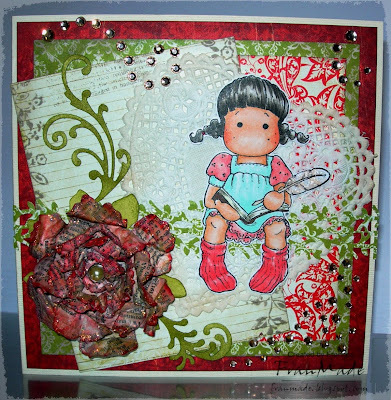 This flower is a lot bigger than the last one I made, as I've used the Tim holtz tattered floral die. And as the packaging on that showed them with print all over it made me do the same! I just found a hero arts definition stamp and randomly stamped that all over them to make it look like page from a book (hence I chose my little Tilda writing in her book) before sponging brick red distress ink all over it. Well, I'm glad I managed to leave you with another card to look at this week. Enjoy your weekends and I'll be back next week, sometime. Thank you for visiting. I'm off for some lunch and then see if I can't squeeze in a bit more colouring before work. Stamps: ' Tilda writing Diary' from earlier Magnolia release at the start of this year. Hero arts 'handmade definition' used on the handmade flower. Others: Stickles. Pearl brad for centre of flower, self adhesive gems, flourish template & paper heart doily from The Hobby house. Hello and it's another week already - time sure is zipping by at an alarming rate and it's May already. Just wish this weather would catch up and make up it's mind whether it wants to stay sunny/warm or wet/cold so I can stop turning the heating on & off. Anyway, enough of my moaning. CCT theme is 'boys to men' so we want to see cards aimed at the men in your life. So, seeing as time is going by so fast thought I'd get ahead and get my father's day card ready for FIL as I know it'll be June before I know it and I'll get the "have you got a card?" from hubby right at the last minute! 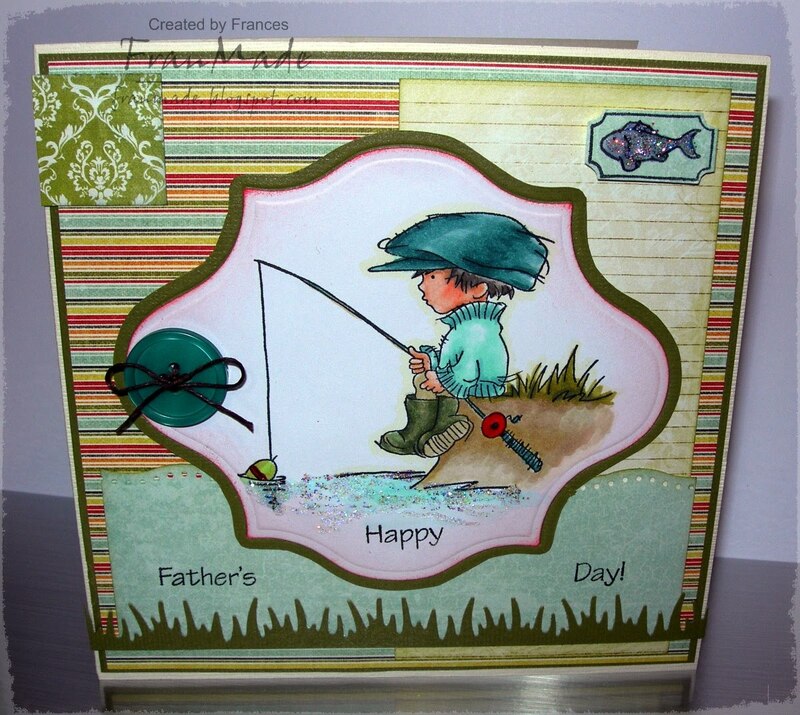 As per most of my men's card, have kept it simple and only used button and string for embellies. 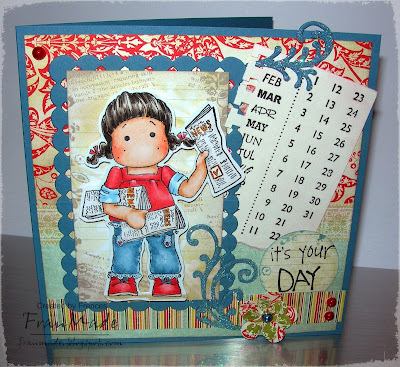 The cute image is LOTV which I've had ages but only just got round to using and the sentiment and cute fish in the corner is from an old MFT set. Well, thanks for stopping by and hope you all have a lovely day. Will be interesting to see who's in No.10 come morning.